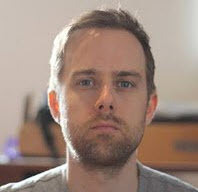 While Audacity is a great audio editing utility with the ability to record sounds and edit them afterwards it still felt a little bit overweight for the mere taks of recording sounds fast on a computer. I found a freeware utility that can record sounds from any incoming source in various formats including ogg vorbis, monkey audio, mp3 and acm. Wing Commander back in the 90s was a phenomenal successful game franchise and is still considered one of the best - if not the best - space simulation game that was ever created. It spawned lots of sequels and included cinematic story telling. The Wing Commander series was developed by Origin which was later bought by EA where the game series found an abrupt ending. If you use the Windows Vista Media Center you might have noticed that playback for various formats is not supported by default. You can't playback divx, xvid or h.264 movies or play mp3 or aac files by default which is really annoying if you want or have to use the media center. Do you remember Blackvipers services recommendations for Windows XP ? The site helped me a lot when I started using Windows XP by explaining the services that were running on my system. I just the information on his site to disable services that I would never need which had the effect that it speed up my system and hardened its security at the same time. More and more users use wireless connections to connect to the Internet, many do receive a wireless lan router by default from their internet provider and forget to protect the router and the connection properly. Insecure Wireless routers are a main target not only of hackers but also of neighbours in the vicinity who like to waste your bandwidth instead of their own. A good friend of mine recently brought her mobile with her and connected it to my computer. The phone was the Sony Ericsson W810i and I had to install the software for the mobile that I downloaded from the official homepage. Everything worked fine until I uninstalled the software again and realized that the desktop icon was not removed during the uninstallation. 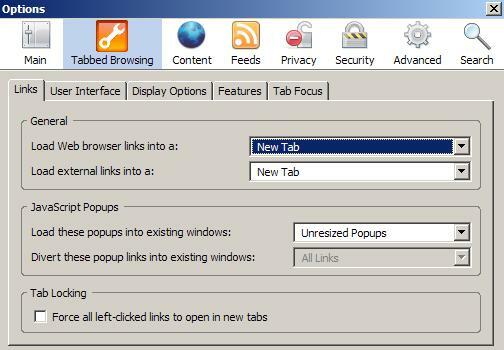 Firefox users can configure their tabbed browsing experience by using the about:config command in the address bar. An easier way than to change the settings directly using the above mentioned method is to use a extension that displays them neatly in the options for faster and better access. Windows XP will be the dominant operating system for the next years even though Microsoft released the successor Windows Vista just a few days ago. The major disadvantage of Vista is that it is hardware hungry and poses problems to users of Windows XP who would like to change but can't because of the hardware of their computer. It seems that someone found out a way to create download links to the mp3 files that one can listen to on the profile pages of the bands that have a myspace website. The script to decode the myspace url and extract the mp3 links is working well and uses Ajax for ease of use. I have not been posting new Firefox extensions for some time and I think it is mainly due to the fact that I got all the good ones covered and that only a few new ones come out after all. It's all Text is one of those extensions that could make a great impact for some Firefox users. 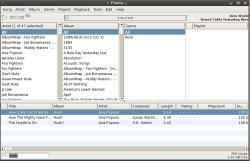 Floola is a multi-platform freeware replacement for iTunes which adds some much needed features that iTunes does not offer. Before you can use Floola you need to prepare your iPod and enable it to work as a portable hard drive. A good walkthrough of the different steps can be found at the official Apple website. When that is done you need to configure iTunes to manages songs and playlists manually. If you are looking for an easy way to convert divx movies for special devices such as mobile players, pdas or mobiles you should take a look at the excellent freeware application Pocket Divx Encoder. Pocket Divx Encoder can be unzipped and run from that location without installation. You may select a device from the list if you want to encode the files for that device, it is possible to change the device later. Windows has no obvious method to lock folders, even administrators have no obvious way of locking folders. Locking folders could be important if you want to hide certain files or folders to prevent someone else from seeing them or altering the contents. You never know what your children could do until they do, so better lock the important folders. Taking pictures while you are on holiday is one thing, linking those pictures to Google Earth using the geolocation feature is the next level. Instead of just showing the pictures that you have taken you can now show the viewers the location the picture was taken in Google Earth. I experienced some troubles installing files on my system and discovered that my partition with Windows was having only 50 megabytes of free space. This was astonishing because it is a 10 gigabyte partition with only Windows and some tools that occupy no more than 3 gigabytes. A quick check revealed that the mail folders from Thunderbird would occupy more than 3 gigabytes of space in the application data folder on the partition. We all known that quite a few spammers make big bucks by offering software like antivirus, antispyware or hard drive utilities whose main function is to either spy on the user or spam him. Those products are quite common nowadays and it is difficulty for an inexperienced user to remove the software completely again. It is really painful to open a file in Windows if the directory that contains the file has a lot of files. Ever had to find a file in the windows folder or another large folder like system32 ? 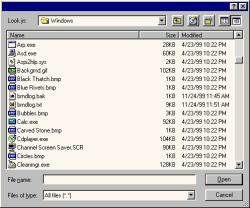 The freeware Windows Multienhancer enlarges the dialog box that displays the files and adds additional information like file size and the date the file was modified. This is done by patching the Comdlg32.dll if the version that is installed on your computer is supported by Windows Multienhancer.